Members of Meridian Technology Center’s SkillsUSA Team Works teams have a few more tools to work with thanks to Stanley Black & Decker. 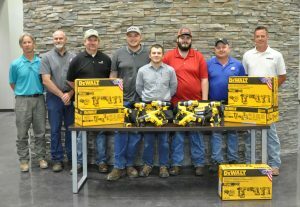 Justin Schumacher, account manager for Stanley Black & Decker, recently visited students in the construction trades programs at Meridian Technology Center and presented winners of the Oklahoma SkillsUSA Team Works contest with DeWalt 4-Tool Combo Kits. “We appreciate the partnership that we have with Meridian Technology Center and with Carpentry instructor Cy Boles. It is an honor for our company to be able to do this,” Schumacher told attendees. Each student received a kit that includes two drills, a circular saw, an LED light and two lithium-ion battery packs. The Team Works skills contest is made up of up to four students who are tasked to build a construction project over the course of three days. 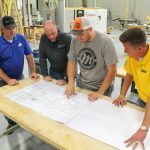 Contest participants are judged on their ability to work as a team as well as how they demonstrate technical skills in the areas of carpentry, electrical, plumbing and masonry. During the recent Oklahoma SkillsUSA conference students in Meridian’s construction trades programs swept the Team Works contest, winning the secondary and postsecondary divisions. Members of the secondary team are Trayton Clinesmith, Perkins; Alexander Ingram, Perry; and Stillwater students Jadon Norris and Austin Mears. Postsecondary team members are Stillwater students Christopher Brubaker, Guy Major, Seth Flack and Seth Santiago. 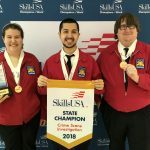 These students, along with other first-place contest winners, will advance to the SkillsUSA national leadership and skills contest in Louisville, Kentucky, June 19-23. Secondary team photo caption: During the recent Oklahoma SkillsUSA conference students in Meridian’s construction trades programs swept the Team Works contest, winning the secondary and postsecondary divisions. Stanley Black & Decker donated DeWalt 4-Tool Combo Kits to each member of the winning team. Left to right are Carpentry instructor Cy Boles, team members Jadon Norris, Austin Mears, Alexander Ingram, Trayton Clinesmith; and Justin Schumacher, account manager for Stanley Black & Decker. 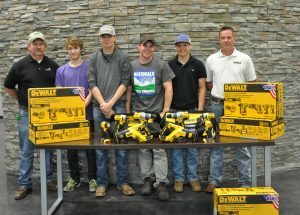 Postsecondary team photo caption: Stanley Black & Decker donated DeWalt 4-Tool Combo Kits to students on the winning SkillsUSA Team Works team. Left to right are Masonry instructor Bret Pickens, Air Conditioning and Refrigeration instructor Travis Snowden, Carpentry instructor Cy Boles, team members Christopher Brubaker, Seth Santiago and Guy Major; and Justin Schumacher, account manager for Stanley Black & Decker. Seth Flack is absent from the photo.